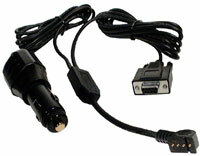 Garmin PC Interface with Vehicle Power Cable (010-10268-00) €56.00 - buy online at mysatnav.ie - Ireland's leading GPS & Sat Nav store. This cable allows you to make a powerful connection between your GPS and your PC. Create routes and waypoints on you PC and transfer them on to your GPS.